What if New Orleans really is dead? Inescapably, we were going to get "mourning New Orleans" articles today, and here is a good one by Josh Levin of Slate. And inescapably, too, we're going to get "reports of our death are greatly exaggerated" stories; already, for example, we're being reminded about how rebuilding after disasters is good for the economy. To measure how much people love a city, count how often the city is declared dead. For cities, death is an easy exaggerating metaphor: we say that a city is dead because some part or aspect of it that we loved is gone. So if a city is full of things that people have loved, it's going to get more post-mortems even as -- to the eyes of others -- the same city seems to be thriving. Every new-development debate contains exactly this paradox: A great city, by definition, has no empty space, so if you build something you'll destroy something else, probably something that somebody loves. And so prosperity itself implies death, and hence mourning. That's how big cities are. Cities take this kind of death in stride, and this is a key to their seeming immortality; they don't just outlive people, they outlive nations and even cultures. Of course, cities can be utterly destroyed in every sense, but it doesn't happen often anymore. Even Hiroshima is still there, in some sense; there are coherent ruins, announcing the survival of a city even through a holocaust that none of us can imagine. To die continually is the nature of real cities. Hiroshima is still there, but for most purposes that matter to us, it died utterly in 1945 and is a new city with the same name on the same spot. It's easy to say that New Orleans is the opposite: most of its buildings are standing, but it "died long ago" as so many mid-American cities have died, abandoned by the people with the money to build, and has survived as a theme park on the ruins of what it celebrates. But either way, it's the nature of urban death that we can play those games with the word. When we speak of the death of a city, then, all we really mean is a wound, some change that will always be manifest. And if we really mean death in the permanent sense -- well, that only comes to a city when we stop mourning it. On that score, New Orleans has many great years ahead, and today, I wish it long life. Amid the vertical rush of spectacle that is Vancouver, may I praise the most banal, predictable, and deeply reassuring Prominent Landmark? To see it, look out my window and to the right. Those are the green-glass towers of Yaletown in the foreground, then Vancouver's great livingroom of a waterway, False Creek. And between False Creek and the layers of city beyond, a little hard pea between the mattresses. Yes, it's much less appealing from up close. But it is what it is: Science World, Vancouver's perfectly adequate and predictable place where "young people of all ages" can taste the thrill of scientific learning. Most important, it has one of those essential science-museum installations out front: A sculpture in which shiny balls roll about eternally in cleverly designed channels and bowls. Those red and pink banners beneath the dome have pictures of happy people and giant imperatives like "Discover!" and "Create!" I often pause on the barren colonnade beneath one such enormous 9-year-old girl, to watch the sun set over downtown. It's always a peaceful scene there, long after closing; the roar of the city fades to the oceanic, so that all I really hear are the elevated trains whooshing past, and the seagulls, and the commands of rowing-team captains far out on the water, and the gentle bump-and-ding of the balls in their certain Newtonian paths. There are few better places to perceive that all's for the best in this best of all possible worlds, where even modernist architecture has its God-given place. But I enjoy Science World more from further away, as I suspect many Vancouverites do. It sits comfortably in all kinds of urban compositions, the perfect roundness that throws perfect squareness out of line. With Science World on the table, a skyline can become a still life. So the other day, I went looking for the arts in Vancouver. Visual arts, at least. So I figured, start at the main museum. There are two, and the apartheid they imply is at once a little spooky. There's a world class museum of this region's aboriginal arts, known as the UBC Museum of Anthropology, which curates not just pre-contact cultural artefacts but also the arts of Aboriginal descendants. The UBC museum is a great place, and more about it later. Then, as the central all-purpose art museum of the city, there's the Vancouver Art Gallery. It certainly looks like the official city museum: A bannered historic building on a central square, facing a park, complete with a dramatic sweeping stairway leading to a permanently locked door, and sign telling you to enter around on the side. Looks like the major museum to me. What's here? Four floors, of which three are visiting exhibitions. Currently, we have one floor of Table Scraps from Great Museums of Europe (currently Rodin, whose method of casting threw off lots of table scraps on the way to each Great Work). Then, we have two floors of Transgressive Postmodern Terminal Hipness, also mostly from Europe. Then, on the top floor, we have the permanent collection and the the sole exhibit area devoted to British Columbia artists. It consists of one artist: Emily Carr. If you come looking for some sense of the range and diversity in the history of BC arts (as opposed to anthroplogies! ), this appears to be it. And if you look around the rest of the arts scene, well, if it isn't Emily Carr, then it probably graduated from Emily Carr Institute, the leading local art school. Her name is a little like the name Washington in America; so ubiquitous that it's hard to focus on what if anything it means. 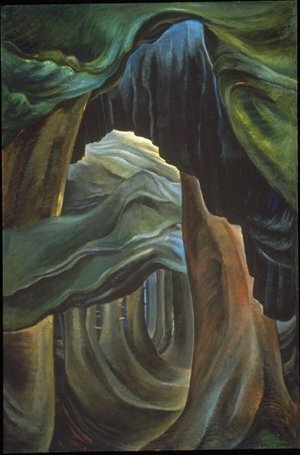 I like Emily Carr. Certainly, her biography appeals, perhaps because it is almost stereotypical for a great artist: a family ignorant of the arts, financial and health struggles, belated recognition, and above all a searing lifelong solitude. Photographs of her as an old woman, an obviously prickly character living in a camper in the rainforest, could almost have been Georgia O'Keeffe -- just subtract money, and add water. Her hard-textured expressionist landscapes capture the enclosing and disorienting quality of the coastal rainforest, where even the outdoors is divided into hallways, rooms, closets. She renders foliage as cloth, but the cloth never flows; it feels more like velvet: heavy, static, suffocating. Sometimes it seems to be laminated or shellacked. You can walk in her rainforest and feel the repressions of her rural childhood. In short, this is classic mid-century expressionism. She learned it in Europe, brought it home, applied it to her world, and created something that met the need when BC finally became urban enough to need a great local artist. In short, like anyone else that we'd call a success, she found a need and filled it, or perhaps a need, seeking fulfillment, found her. Either way, she has a permanent floor in the center of Vancouver, and more power to her. Still, I wonder how she'd feel to know that decades after her death, she'd still be the last word in official BC arts.